Tree & Shrub sale - the pictures. Shrub/small tree photos, descriptions, and more links. The following SHRUBS have been ordered in the past ... some need to be special-ordered. They come in 3-gal. containers and are $20 each. Downy Serviceberry ... an easy-to-grow small tree with white spring flowers, clean summer foliage, persistent leaves and brilliant red fall color. Height: 15-25 feet. False Indigo or Shrub Indigo has attractive lavender flower spikes. Medium to wet well-drained soil, but tolerates dry. Good for stabilization. Height 4-12 ft; Spread can be wider than height. Deer resistant. Black Chokeberry - white flower clusters in spring, large fruits attract songbirds, and deep red fall foliage. Remove suckers to prevent spread. Tolerates boggy soil. Height and spread 3-6'. American Beautyberry fruits are long lasting until discovered by birds, esp. quail. Dies back in winter but extremely hardy plant. Tolerates drought. Height and spread 3-6'. Eastern sweetshrub or Carolina allspice has glossy, aromatic, leathery, dark-green foliage. Erect, multiple stems create a rounded outline. Flower are often quite fragrant. Resistant to disease and insect problems. Remove suckers to prevent spread. Adapts to many soils. Height and spread 6-10'. Buttonbush ... prefers wet soil and full sun, but can handle a dry spell. Hundreds of ball-shaped, creamy white flowers dangle from Buttonbush in August. Butterflies and insects find the nectar of Buttonbush irresistible. Deer resistant. Height 5-12'; spread 4-8'. Southern Gentleman Winterberry Holly ... a male winterberry cultivar necessary for pollination of female Winter Red Winterberry Holly and other southern winterberries. A good rule of thumb is one male to six females. Winter Red Winterberry Holly ..Winterberry is a slow-growing, suckering shrub with upright, rounded habit. Fruit occurs on female plants and requires male plant for pollination. Virginia Sweetspire... is a small (Height and spread is 3-4'), multi-stemmed shrub. White flowers hang in cylinders; long green leaves turn red, orange, gold in autumn. Spicebush... is a broad, rounded multi-stemmed shrub covered with fragrant, yellow-green flowers in March and April. In fall, the aromatic light green leaves of Spicebush turn a deep yellow-gold while birds feed on the small, brilliant red fruits produced on female plants. Ninebark ... blooms for weeks in summer with clusters of white flowers. In fall, its seed clusters are enjoyed by birds. Exfoliating mature bark provides additional winter interest. American Plum ... Abundant early spring blooms are fragrant. Curly dark bark. Fragrant Sumac or Aromatic Sumac has red berries that follow yellow spring blooms. Brilliant red and orange fall foliage. Leaves and twigs are aromatic. Smooth Sumac is like the Staghorn Sumac minus the hair on the leaves (hence the name). Superb fall color. Naturalizes to form thickets. Food and cover for watchable wildlife. Height and spread 9-12'. Staghorn Sumac ... has brilliant red fall foliage and compact clusters of dark red, velvety fall berries enjoyed by wildlife. Forms thickets. Spring or Ozark Witchhazel (native across the river) From late winter into early spring, this unique native shrub blooms when little else is flowering. The fragrant flowers can persist for three to four weeks and may be clustered or solitary, yellow to dark red in color. 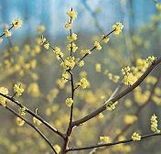 American Witchhazel a tall shrub or small tree with upright spreading branches. Fragrant, yellow fall or early winter flowers open are a boon to migrating hummingbirds. The golden fall leaf color can be outstanding and often occurs at the same time of bloom. Wild Hydrangea ... ... plants form rounded mounds and bloom in June with large clusters of flat, creamy white flowers that last for many weeks and can be used in dried flower arrangements. Flowers attract butterflies and other pollinators. A hardy native for almost any site, providing food and cover for wildlife Tolerates erosion, clay soil, wet soil. Height and spread is 5-8 ft. Suckers form colonies; prune for best foliage. Arrowwood Viburnum ... has clusters of white, flat-topped spring flowers. Its blue-black fruit attracts wildlife. Leaves turn red to orange in fall. Nannyberry ... an important food plant for winter wildlife. Dark blue fruits ripen in fall. Fall leaves turn red.